Dr Williams's Library | Event: ‘Dissenter Diplomacy: Sub-diplomatic efforts in the making of the Anglo-American alliance, 1850-1918'. ‘Dissenter Diplomacy: Sub-diplomatic efforts in the making of the Anglo-American alliance, 1850-1918'. 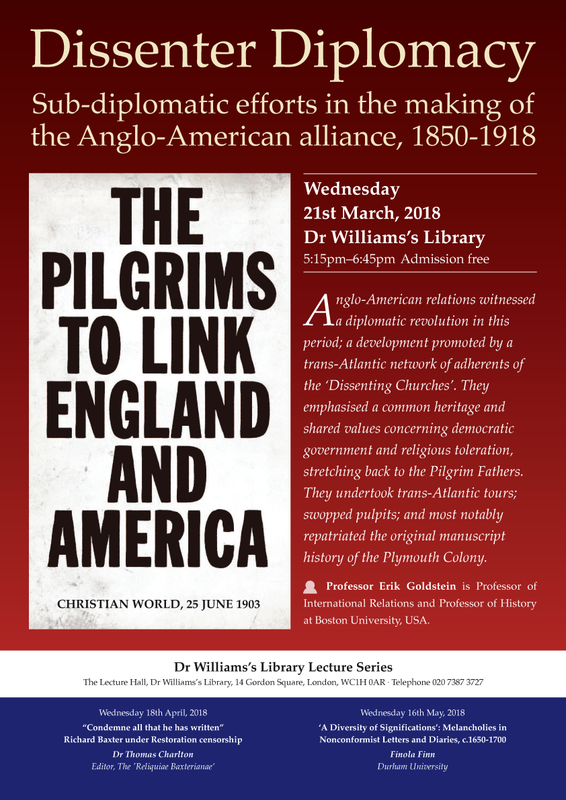 Anglo-American relations witnessed a diplomatic revolution in this period, a development promoted by a trans-Atlantic network of adherents of the ‘Dissenting Churches’. They emphasised a common heritage and shared values concerning democratic government and religious toleration, stretching back to the Pilgrims. In creating this community of common interest their activities included: joint building projects in England commemorating these links, including churches in Gainsborough, Southwark, and Lambeth; trans-Atlantic tours; the swapping of pulpits; and notably the repatriation of the original manuscript history of the Plymouth Colony. Their policy objectives included some form of Anglo-American alliance and international arbitration. DWL is a significant source of material for this study.